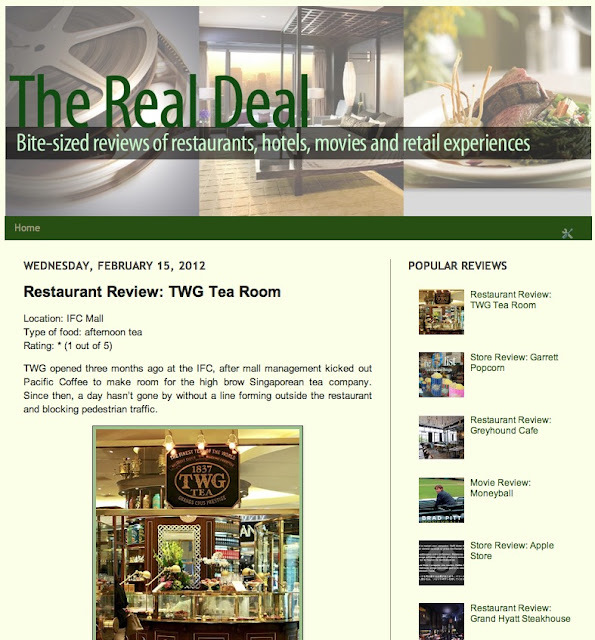 NEWS FLASH: New Blog《The Real Deal》Launched! 快訊: 新博客發放! My brand new blog The Real Deal (http://realdealhk.blogspot.com) is now up and running!! The Real Deal is a comprehensive review site that offers straight-to-the-point opinions on the dernier cri in the city's leisure scene: restaurants, movies, hotels and stores. Each "bite-sized" review aims at giving you the lowdown on everything you need to know to seek out the city's best kept secrets or before you step into the next tourist trap. Combining wry humor with razor sharp observations, the blog serves to inform and entertain.